The Small Magellanic Cloud (SMC) is one of the closest galaxies to the Milky Way. Chandra observations of the SMC have resulted in the first detection of X-ray emission from young stars with masses similar to our Sun outside our Milky Way galaxy. Most star formation near the tip of the Wing is occurring in a small region known as NGC 602, which contains a collection of at least three star clusters. One of them, NGC 602a, is similar in age, mass, and size to the famous Orion Nebula Cluster. Researchers have studied NGC 602a to see if young stars - that is, those only a few million years old - have different properties when they have low levels of metals, like the ones found in NGC 602a. The combined X-ray, optical and infrared data also revealed, for the first time outside our Galaxy, objects representative of an even younger stage of evolution of a star. These so-called “young stellar objects” have ages of a few thousand years and are still embedded in the pillar of dust and gas from which stars form, as in the famous "Pillars of Creation" of the Eagle Nebula. A labeled version shows the location of these young stellar objects (roll your mouse over the image above). Coordinates (J2000) RA 01h 29m 12.40s | Dec -73° 32´ 01.70"
This is my favorite image of all Unlike most other photos of celestial objects, this captures all the subjects one sees when they turn their eyes skyward - nebulae, galaxies, and stars. And the most striking aspect of this photo is that one can sense 3-D - it is not the flat surface one normally experiences in looking at other photos. Hello and thank you for sharing the beautiful astronomy multimedia galleries. Is it possible to capture the pictures in optical, UV and X-rays range for taking photo by the space telescopes with making a little balance in the electromagnetic wavelengths intensities and or shrink them to become visible? so we have options to change the view to X-Ray view, optical view and both with first photography. Thank you for this. Has to be one of my favorite. It's amazing how small we are in the universe, but yet how big we are to be able to reach out and study such happenings. Cant's stop looking at images like this. Phenomenal stuff. The fast facts and spectrum/spectral distance estimate visuals always helps with clarity and understanding. Thanks for adding those. Worth more time than I have to study right now, but....WOW!!! work at Harvard, and in particular, the most spectacular images on the Web. Incredible pictures with such clarity. Great job NASA. Happy to support this kind of incredible work. Keep them coming and stilll interested. Wow! Yet another great one! Well, something is happening there for sure. Thank you to all of you because of these wonderful images. 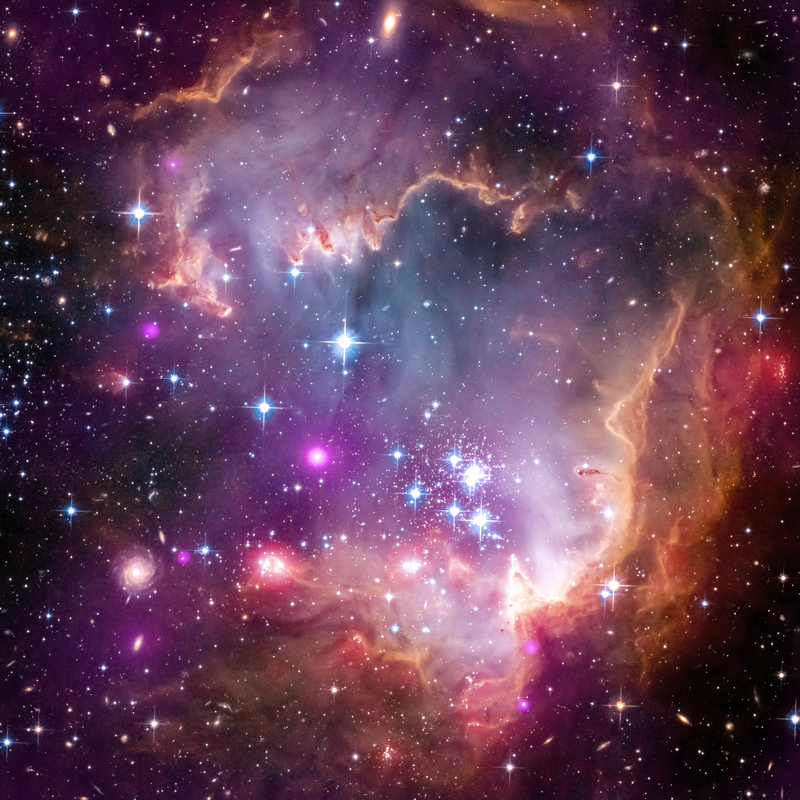 Young stars in the Small Magellanic Cloud (SMC), one of the closest galaxies to our Milky Way. About 160 light years across. X-rays are purple, optical are red, green and blue, and infrared red. In the constellation Hydrus in the Southern Hemisphere.